What’s the one thing that unites roadies, mountain bikers, and BMX bandits? Cycling through winter makes you badass. 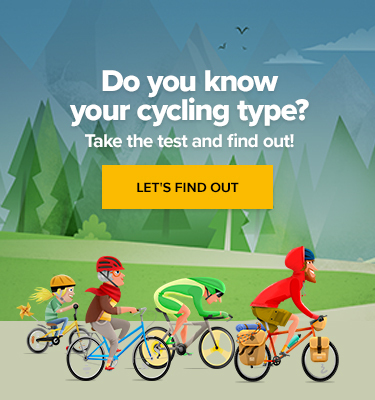 So here’s how to make the right choices about the bicycles you’re going to be riding. It doesn’t matter whether you’re cycling off-road or on smooth tarmac, any wet surface is going to make your tyres spew corrosive material onto your frame and drive chain. Check out this video that tells you how to prepare your mountain bike for the worst winter conditions. If you’re a roadie, the same principles apply to you – as soon as the tarmac is salted, your bike is just as vulnerable as if you took your whip through the mud. It’s cold, it’s winter, so show some solidarity. Get the hose out and wash the gear-grinder from your bike before it ruins your chain. A common misconception is that knobbly tyres provide a better grip – they don’t. The reality is that knobblies don’t give you a better grip on tarmac. Knobblies only add grip on muddy, shifting, textured surfaces. On a smooth and wet surface, slicks rule supreme. Think about the shape of your bicycle tyres. Even on ice, slicks provide a greater contact area. The larger the contact area the better – there’s a reason that ice skates aren’t knobbly. But autumn will push you to the boundaries of uneven and unpredictable surfaces. So, watch the above video again – and learn something. Rounded tyre profiles give much better grip on two-wheeled vehicles so in colder weather select smaller tyres, or keep your fat-bike tyres pumped to maximum pressure, and that way your studs will allow you to travel through the snow at much higher speeds. As autumn descends into winter’s icy grip, conditions become seriously hazardous. Sometimes, you’ll need to assess the weather forecast before each ride. Will there be ice? Will it be a hallowed sunny morning with a damp tarmac in an ice cold air? Well, here’s the solution. Usually, I’m not a fan of Kickstarter solutions – but I’m glad that there are entrepreneurs earnestly trying to solve cycling’s biggest problems. After all, who hasn’t found themselves halfway through a ride and wished they’d been on the other bike? You only make those decisions in winter – right?